Those are big words Numark. But at this point, it’s nothing but marketing hype. Thus it’s time for me to dive in and see if anything has changed, or indeed just got a bit better. We had planned to have this out much sooner — just before BPM 2014 in fact. But the unit sent to us had pre-release firmware. Our policy is to only use production units in reviews, and none had been available up until recently. But the review is here now. Let’s underline once again how we do things around here. We could write a review that is little more than the manual in another font. But there is a wealth of existing information that explains in words, pictures, and video exactly what the Numark NV is about. Instead, we choose to give you our opinion about what it does, because that’s what a review is — an article full of opinion. 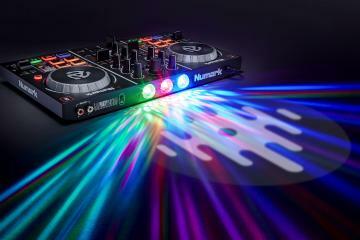 So to get you started, you should visit the Numark NV site, read the manual, and watch these videos we prepared earlier. The Numark NV is a four channel Serato DJ powered pure controller, and by pure I mean it’s not an analogue mixer as well. It’s very much in the now established layout seen in many controllers before it, and included much of what came in the NS7 II and the NS6. If I were to describe the NV to anyone, I’d say it’s the mixer-free NS6 with NS7II bits and screens in controller form. Make sense? Let’s dig in. Controllers have come a long way since the vintage (too soon?) days of the Vestax VCI-100. But bar some notable diversions, the mixer in a jog wheel sandwich format is cast in stone. And the Numark NV doesn’t really stray far from the path of the established Serato controller norm, but let’s go over it briefly. The Numark NV is a reasonably compact and largely symmetrical unit, aided aesthetically by being just 25mm thick. It’s Traktor Kontrol S4 sized and deliberately so, and in the right bag might just sneak inside a plane as hand luggage too. The construction is all plastic — a complete base and sides with matt and NI-esque shiny plastic top panels. It feels reassuringly heavy though, but breaking out the trusty worxdriver showed that the guts are crammed with nothing but circuitry. If you twist it there’s a little movement, and with a shake there’s a minor rattle but otherwise feels like it’ll last. And by last I mean the two years that you’ll own it until your GAS takes hold at the followup unit. One last thing — to get you started with the whole remixing and production elements of the NV, Numark has teamed up with Toolroom Records to provide over 2 gigs of artist stems, samples and loops. It’s all good stuff, and definitely gives you a leg up on using the finer points of the NV. The four channel mixer throws up no surprises and is more or less straight out of the NS7II. Three band EQ to kill with gains and a hi/lo pass filter knob, all neatly spaced and easy to use, complete with touch controls too — more on those later. Each channel has crossfader assign, and making a welcome return is a hardware implementation of crossfader start. Sometimes I feel alone in my love of this feature, but having messed with it and using the touch controls and pitch at the same time, I’m even more in love with it. Getting briefly into mixer specifics, the Numark NV’s metering is better than former Serato based controllers. Thankfully there is per channel and master metering, delivered by five part LEDs neatly sat under the faceplate. Only five? Three green, one amber, and a single red is all you get, but I found this to be sufficient. Channel metering is post EQ and filter but pre effects, but master is post everything. This is much better than so many other Serato based controllers. It looks like the message has got through. To get this out of the way now, the NV is not a standalone DVS compatible mixer. To be honest, this doesn’t bother me one bit. If I’m buying a controller, it’s because I don’t want to use turntables or CDJs, so having to pay for the addition circuitry to enable something that I suspect most people won’t use anyway is a waster. I’m happy that it’s just a controller, and the NV feels better for it. You may choose to disagree though. Other Serato DJ controllers are available. Nothing too out of the ordinary here. All four channels 45mm Alphas — well I’m guessing so anyway. Having previously pulled the NV apart, I can see that the line faders are soldered to the motherboard. I state this for those who might want to cram mini Innofaders into all slots rather than it being a commentary on potential failure. The crossfader is certainly an Alpha, and is removable to maintain or replace. And it was designed to work with the Mini Innofader too, although I haven’t tested this myself. Out of the box, the NV is perfectly acceptable for light scratching, and has a simple switch between dipped and sharp curves, and software crossfader reverse and line fader curves too. 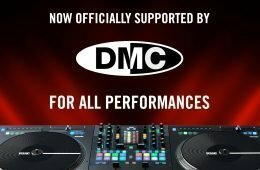 So the Numark NV is scratchable, but don’t get your hopes up for DMC performance. Summing up the mixer section — good work. Shame but about the lack of analogue ability, but this is a controller. Now a standard feature on just about every controller, the multi-function pads appear on the Numark NV too. The pads themselves are rubber (they’d be rubbish otherwise) and are eye-scorchingly lit with RGB LEDs, so they’re not fixed to a colour. Two comments about the performance — I noted some double hit issues with the NV. Reporting this to NV, I was met with surprise as they’d not experienced this. Further investigation narrowed this down to needing a little bit wearing in. A few hours of pounding should eliminate this, if indeed it happens to you at all. And being as small as they are, in the heat of the moment, I found myself hitting the wrong button. 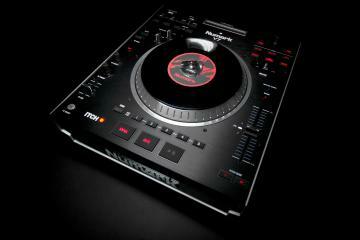 These are fully featured with just about every Serato DJ feature you could want, including Serato Flip but the faceplate isn’t labelled up as such. If you’re lucky, you’ll be one of those who gets Flip for free. If you want to know what all the buttons do, check out page six of the manual. As with previous Serato DJ controllers, the pads do a lot, and deliver a lot of features from eight small buttons. I think you’ll quite happy with what you get. Numark was onto a winner when they introduced touch or capacitive controls on the NS7II. And the NV continues that winner with a wide combination of filters, rolls, EQ, and effects. For example, pressing the filter roll button makes the filter knob roll at the same time, and Touch FX engages the effects momentarily. I still find the process a tad confusing (an extra button might help), but the results are excellent. While there is much chatter about ditching jog wheels, Numark hasn’t quite gone as far as that and has stayed with the tried and tested approach to DJing. Coming in at 4″ wide, they’re small touch sensitive affairs, and free wheeling enough to offer reasonable spin backs. From a scratch perspective, the size makes them very lively indeed, and requiring a lot of adaptation of technique to pull off clean scratches and juggles. And techniques like patting are incredibly difficult to do unless you hold the jog wheel with one hand. That said, I don’t think the Numark NV is being sold as a controller for turntablists, but you need to know this sort of detail. While they perform well, they spoil the aesthetics of the otherwise slick design. I get that they’re small, but do they need to be so deep? Why recess them and then make them as deep as they are? Half as deep and in black would have made the NV a much better looking product. On a related note, the Numark NV comes with the usual censor and reverse features. But for those who like to get a bit frisky with the jog wheel, there’s also Slip mode, which is amazing when used with the jog wheel, but also when getting lively with some of the effects. Using touch effects and Slip mode is also a lot of fun too. In an age where pitch is becoming so passé, it’s nice to see 100mm pitch faders on the Numark NV. They’re smooth running, without a centre detent, and a white LED to indicate zero, and pitch bend buttons to assist in manual beat matching, but you could just as easily nudge the edge of the jog wheel. Range is on a button next to the screen and offers 8, 16, 50% with a 0.1% resolution on screen. It would be nice to see 25% on there as well — can’t be that hard to add can it? A couple of issues I’ve come across — if you’ve made a pitch adjustment and wish to change the pitch range, the pitch remains at the currently selected one until you move the pitch fader. I’m trying to work out if this is a safeguard or a bug. Either way, when doing tone play with a track, this is a pain. Perhaps this could be a software switch. Slightly more worrying is that the zero LED doesn’t necessarily mean zero. I came across this when using the LED as a guide, but not noticing that the actual pitch was as 0.1%. It was only when my doubles play started drifting that I noticed it. This needs fixing, and most probably will be. This is pretty standard stuff for Serato DJ — two banks, with three effects per bank, and all assignable to channels or master. Effectively you can have six effects assigned to a single channel, and those effects all have wet/dry controls and beat parameter controls too. And if you flick the mode switch, three effects become one effect but with an amazing amount of control over that singe effect. Switching effects on the fly is as easy as shift-effects button to cycle through the available effects. The good news is that the effects are all post-fader, so closing a line or cross fader doesn’t lose the tail of that amazing reverb or kill an echo dead. Speaking of the effects themselves, Serato switched to iZotope effects a long time ago now, so you get a pretty standard set with vanilla Serato DJ, and can add more via expansion pack purchases. Now I do read a lot about Serato effects being rubbish, and frankly it’s just not true at all. To call iZotope rubbish is ridiculous, and certainly for the type of DJ looking to get an NV, the effects are outstanding, and from a performance perspective, when I piled six effects on top of each other, Serato DJ held up just fine. Given the fact that the NV bucks the trend of making it a mixer too, this won’t take long. There’s a single 1/4″ mic input (without phantom power as a side note for the mic users out there or beginners who think that they can plug any old mic in) and RCA aux inputs, with a single gain control for both. The mic however does have a tone control, but neither go through effects or EQ and hit the master bus pre-gain. According to Numark, this is quite deliberate as processing voice through the digital audio routing to make use of effects would simply add latency. Makes sense. You can however only use the mic or the aux, but not both unless you switch them, but they do work independently of Serato DJ and USB, so should worst come to worst you can still run an external source through the NV while fixing an issue. Really, the mic and aux sections are specced as a concession, because leaving them out would have annoyed a lot of people. But the mic-heavy mobile DJs may well be disappointed. Everyone else however will be quite happy. Output wise, the NV offers the now standard jack and minijack connectors with cue/master knob, gain, and in a most welcome move a split cue selector. Interestingly, both headphone ports work at the same time. I’ve never tried it before, but apparently Numark (and probably everyone else for that matter) have had it like this for ever. As for full-on outputs, the NV comes with master balanced XLRs and RCAs, and RCA booth outputs. Booth and master have their own volume controls too. Again, Numark has been listening — booth is important to a lot of DJs, not least those that take their controller into a booth, which is a lot. I guess these must be things that change everything then, because we’ve seen everything else on the NV before. The theory goes that controller DJs have become transfixed on their laptops screens, and that having their computers close-by is a performance killing distraction. Is it any worse than a DJ disappearing behind the decks to dig out the next vinyl, and a CD user flicking through their wallets? Well yes, if only because they could be doing anything on their laptop, and it just doesn’t look like DJing as we know it. Thus Numark has decided to include a couple of nice high res screens right into the NV. We’re not talking ultra bright retina screens here, but perfectly serviceable phone sized screens. They’re not touch sensitive though, so those dreams of scratching the Serato waveform with your finger will just have to wait. I find the colour a little flat and the waveforms aren’t a perfect match to what is on my laptop screen. It’s a minor detail, but that’s what we’re about here. Library: This shows you the basic structure and lets you dig as deep as you like. Performance View 1: This shows the Serato virtual deck, effects parameters, a full waveform plus auto loop steps. Performance View 2: This switches a zoomed waveform for the auto loop detail and the virtual deck. Library mode works pretty well, and navigates around much like any other controller. Sadly, the screen only shows artist, title, and BPM. If you want to see any other information such as key, you’re back looking at the laptop screen. Your success with performance modes will depend on the type of DJing that you do. I liked view 2 most of the time, because the large waveform in front of me made deck tricks a lot easier, as is setting hot cues on the fly. But for some reason, despite having beatgrid editing controls, they don’t show in the NV. That would be a very useful thing to have. So to the issues. Well firstly, the limited amount of info displayed in the library is a problem, especially if you have a huge range of tracks. These days, key information is becoming increasingly important, and you can only see it once you loaded up a track, and by that time it’s too late. The big issue for users with large libraries and playlists is the lack of search or sorting on the NV screens. Unless you have a photographic memory with a very manageable set of playlists or tracks, that laptop screen is still going to be open, which does rather negate the whole point of the built-in screens. Something that I thought was an issue actually isn’t in the whole scheme of things. In use, I wished for the ability to have different crates or playlists open on each screen, but you can’t. Why? Assuming that Serato is using Sysex to push data to the NV screens, it’s not possible to have more than one crate open. Boo. But this is no different than Serato on a laptop either. Yes, you can have an expanded tree on a laptop, but you can only be in one crate at once. Maybe Serato will devise a way to let this happen, but it might be some time. This is when screens will trump the laptop. Can you leave the screen closed? I don’t think I’d ever fully close it as I don’t trust any computer to work with a closed lid, or wake up safely when opened. But part closed and pushed to one side running something like Caffeine on a Mac — I think the answer is a tentative yes, provided you know your library inside out. It’s so much easier having a big screen where you can scroll, click, search, and all those other functions available to you. There’s also the issue of stacked waveforms, which for many is seemingly as important as the tracks themselves. If you absolutely positively gotta have stacked waves, the laptop will remain open. That said, I definitely enjoy the information at my fingertips, especially the full and zoomed waveforms. My next and obvious wish is for a touch screen version so I have simply tap the full waveform and jump to exactly where I want to be. If only the strip search had remained — I’d just got used to it. It’s a controller, and usage of such things is well proven. The workflow is honed and Serato DJ works in a most optimal way that allows you to deliver music to your audience. And the screens only help make this better. As I’ve said, I like having the waveforms in front of me, and have definitely noticed that I don’t miss the laptop screen as much as I thought. This is probably down to having a small set of crates and just a few hundred tracks to remember. My constant bugbear of shoehorning four decks into a controller is amplified here. There is a single button labelled “deck” against each screen and a small number than changes on each screen. I feel that the visible change could have been more prominent (Numark is working on this for a future update), but my gut feeling is that like with the NS6, most people will only be using two channels anyway. But what of other Serato products? Serato Remote seems to hold up just fine, but with everything that the NV offers, it seems surplus to requirements. Serato Video doesn’t really have any impact at all on NV usage. I don’t know if it’s technically possible, but having the videos playing on the NV screens would be epic, and one less reason to look at the laptop screen. About other software — being MIDI controllers, it’s highly likely that you’ll be able to map the Numark NV to whatever software you want. I’ve always found this to be a compromise, as the performance is never the same as the one it was designed for. This is going to be even worse because of the screens. Not that the controller won’t work, it’s just that you’ll be staring into the dark empty spaces doing absolutely nothing. So unless some clever people work out how to put Traktor or VDJ info on those NV screens, it’s even more of a compromise than ever. I look forward to seeing somebody hack it though. Rounding off, the Numark NV is a lovely controller to use. I see it as a jack of all trades rather than being specific to a genre. Turntablists should look elsewhere, but there’s more than enough to keep less demanding mix DJs happy, and equally plenty to keep the more creative DJs challenged. Changes everything? Hmmm… the problem with that is that it doesn’t have anything really new on it. Almost all of it has been seen on previous Numark controllers, and the screen has been seen on the Stanton SCS.4DJ and even on older Numark products like the HDMIX and iDJ2. Those devices didn’t change any games, but did spark conversations about true all in one controllers, which the Numark NV isn’t. But this is more a comment on the over-exuberance of the marketing. The game was changed a long time ago, and has brought us to a point where we have an amazing controller fully in tune with Serato DJ and has very smart features like touch controls and performance pads. Without the screens, it’s an excellent NS6 mkII. With the screens however, it’s still an excellent NS6 mkII but with two small screens, and given the shortcomings with things like search, using the NV without an open laptop is doable provided you have an intimate knowledge of your playlists and the tracks. 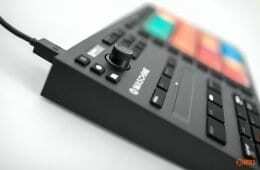 One thing is for certain — it’s just a matter of time before Pioneer and Reloop come out with their own screened controllers, and those controllers will have something that the NV doesn’t because that’s how Serato works. I’d like to think that the next iterations will be touch screens. So no, the NV doesn’t boldly change anything really, but it does bring a distillation of all that is good in controller land, and delivers a very focussed experience for a very affordable price. It, along with the S8 point towards a future where big res screen will be included in an increasing number of controllers. Quality — all plastic, but feels rigid. It’s heavy enough to install a good feeling. The controls all feel good, and the screens are bright and sharp. Features — the Numark NV has just about everything crammed into its small chassis that you could wish for. Value — coming in at the same price point as the S4, but for Serato DJ (and with Flip if you’re quick), the NV’s bang to buck ratio is high. But if you factor in the lack of mixer and DVS ability that the S4 has (albeit needing a computer switched on), then less so. Pros — screens, size, touch controls. Cons — screen detail means that you probably will enjoy the NV more with the laptop open. The Numark NV heralds a future where every controller will have screens. Sweeping aside the hyperbole surrounding the screens, those are not a game changer in themselves — without them the NV would still be excellent. With them however, it’s awesome.